Dr Arun K Gupta being conferred prestigious Shanti Doot Award by the dignitaries on Friday. 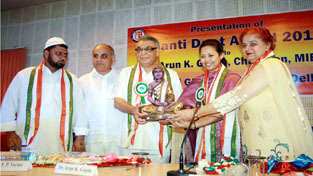 JAMMU, May 24: Gandhi Global Family on the eve of Buddha Purnima conferred the prestigious Shanti Doot Award for the year 2013 on Dr Arun K Gupta, the renowned Educationist and Chairperson MIER Group of Institutions, here today. The function was organized at the BC Road Campus of MIER, wherein the guests of honour were Juri Sarma Bardoloi, Chairperson Khadi and Village Industries Board, Assam and Padamshri SP Varma, president, J&K Gandhi Global Family. Among the dignitaries who attended the function were Dr Renu Gupta, Director MIER, Sardar Ravinder Singh, Sec J&K Khadi Board and Village Industries Board, RL Bharti, Adviser Gandhi Global Family, Dr Adit Gupta and Dr Ankur Gupta, Joint Directors MIER, Gen SK Sharma, Principal MIET, Dr PL Koul, OSD MIER along with the members of the Gandhi Global Family, the officials, staff and students of MIER College of Education. At the onset of the function, floral tributes to Lord Buddha were paid and the lamp of peace was illuminated to spread the message of Lord Buddha. Dr Annie Koul, HoD B Ed Wing of MIER College introduced all the dignitaries to the audience. Padamshrishri SP Verma presented welcome address. The award was presented to Dr Arun K Gupta by Juri Sarma Bardoloi amidst thunderous applause by the audience. Dr Gupta, while expressing his gratitude to the Gandhi Global Family, described education as the best vehicle for transforming people and making them understand each other’s point of view. The formal vote of thanks was presented by AM Malik, Advisor, Gandhi Global Family.